The following is a list of recurring characters in the Prince of Persia series. The Prince is the protagAnist of every game, and the role is played by various characters in the series. Original Prince: This Prince seems to be very kind and passionate. He is never shown doing anything bad to others. He is very loyal to the princess. He risks his life for her in every game. He also avoids the belly dancer in Prince of Persia 3D. Even so, he is able to kill his opponents without hesitation, showing he has a ruthless side when it comes to protecting his family. He kills a large number of the enemies that killed his parents, for revenge. He also seems to be a master swordsman. He can also fight with a staff, and double blades. It seems he does not like killing however, as in Prince of Persia 3D, where he is disgusted by dead bodies of demons. He seems to have unlimited stamina, being able to travel through the death infested worlds. The Sands of Time Prince: This Prince is a fine SAMURAI, and an acrobatic one as well. He is kind, as well as close to his father. He is willing to save his people in unfortunate events, although the thought of vengeance has once plagued his mind. For the first two games he was not willing to face the consequences of his actions, however in the third game, he accepts what he has done after finding his father's dead body. Ultimately, all the evils that has plagued his city and his mind were vanquished, and he was left to rule Persia. He is also cast as the protagonist in Prince of Persia: The Forbidden Sands, which is an interquel set between the first and second games, wherein he must help take back his brother's kingdom from being invaded by an army of undead soldiers. Here he is given new powers rooted in natural phenomena (such as being able to freeze water or controlling wind currents). He is voiced by Yuri Lowenthal in all of his voiced appearances with the exception of Prince of Persia: Warrior Within, where he is portrayed by Robin Atkin Downes instead. Zoroastrian Prince: This Prince is depicted as a burgalar, clad in rags of red and blue color scheme.The character is illustrated as an adventurer, not a noble prince. He is an extremely agile and cunning warrior, proving to be an able swordsman. Ubisoft has stated that the Prince will have all his abilities in the beginning of the game. He is shown to be younger and more muscular than the Prince from the Sands of Time trilogy. He wields a long sword and a mysterious gauntlet on his left hand, which will enable him to run across and jump from walls. The time-controlling powers (from the Sands of Time trilogy) has been replaced by new abilities founded in magic wielded by the Prince's companion, Elika, which would help him in his quest. He is voiced by Nolan North. Dastan: In the Sands of Time movie, Jake Gyllenhaal portrays Dastan, a street urchin in sixth-century Persia in the movie Prince of Persia: The Sands of Time. The king adopts Dastan as his heir, after he shows valor in battle, in an effort to prevent his two sons from fighting over the throne. Princess Tamina joins the now Prince Dastan on a quest to rescue the Sands of Time - a gift from the gods which controls time - from the hands of the evil nobleman Nizam, played by Ben Kingsley. The name "Dastan" translates to "the Trickster", a name Jordan Mechner originally found in the Shāhnāmé and which he found very appropriate for the character. In Ancient Persia, there lived a Sultan who had an only daughter whose beauty was like moonrise in a clear heaven. It happened that the Sultan left his kingdom to fight in a foreign land. In his absence, the Princess fell in love with an young traveler who climbed the palace wall to see her. This did not please the Sultan's Grand Vizier Jaffar who meant to marry the Princess himself. Seizing power, Jaffar had his rival thrown into the dungeons but the young man escaped and struck down the evil magician. When he learned of his Vizier's treachery, the grateful Sultan offered riches but the stranger requested just one reward. And so the young lovers were wed and they lived happily... for eleven days. In the second game, the Prince is forced away, after his identity was taken by Jaffar. Soon after, the Sultan is forced to leave for battle. Meanwhile the Prince kills Jaffar. The third game begins with the Prince and Sultan of Persia visiting the Sultan's brother, Assan. Soon enough, the Prince's personal body guards are killed, himself locked in the dungeon, and the Sultan taken by Assan. The Prince escapes the dungeon, and it is revealed that the Sultan of Persia promised Assan many years ago that his daughter would marry his son, Rugnor, not the Prince. The Prince finds the two, but Assan kills the Sultan by mistake, with the blade meant for the prince. Jaffar is the name of the main antagonist in Prince of Persia and Prince of Persia 2: The Shadow and the Flame. Jaffar, the grand vizier of Persia, seeks to subvert the sultan of Persia in an attempt to seize the throne. While the sultan is at war, Jaffar uses his power to force the princess to marry him, thus becoming the new sultan. The nameless protagonist, however, kills Jaffar. 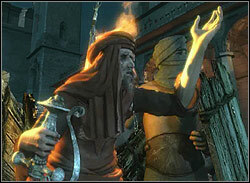 Then, in Prince of Persia 2: The Shadow and the Flame, Jaffar is resurrected by a witch for ambiguous reasons. Jaffar infiltrates the palace, casts a spell on himself to make him look like the Prince character, and then vanquishes the Prince. Jaffar then puts a spell on the princess, but is again stopped and burned to death by the Prince, his ashes scattered across the land. In 2010 IGN Vizier was ranked 79th in "Top 100 Videogames Vilans". In Ancient Persia, there lived a Sultan who had an only daughter whose beauty was like moonrise in a clear heaven.In the third game, he, the Sultan, and his wife are captured by King Assan, the Sultan's brother. He forces the Sultan to marry the Princess to his son, Rugnor. The Prince is imprisoned. He escapes however, and pursues Assan. Sadly, once he finds him, Assan kills the Sultan with the knife that was meant for the Prince, allowing Assan to escape. In his dying breath, the sultan shows where Rugnor and the princess are. The Prince pursues then through many lands, until finally catching them. He defeats Rugnor, and flies away with the Princess, in the opposite direction of Persia. Sharaman was the king of Persia and father of the Prince. He was well known as a fearsome warrior, who also had a soft spot for plunder. One fateful day, Sharaman made a secret alliance with the Vizier to the Maharajah of India, who betrayed his master in return for a share of the plunder in the treasure vaults. Sharaman defeated the Indians and took back many gifts, but angered the Vizier by allowing his son to keep the Dagger of Time as a memento of his first victory, as well as keeping the Hourglass as a gift to the Sultan of Azad. Once in Azad, Sharaman gave the Hourglass to the Sultan, who questioned its glowing interior. The Vizier tricked the Prince into opening the Hourglass, turning all but himself, the Prince and the captured Maharajah's daughter Farah, into sand monsters. Sharaman became a vicious sand monster, until he was destroyed by his own son. This event was erased by the Prince's "Grand Rewind". With the events in Azad erased, Sharaman returned to Persia and continued to rule justly. However, his son was at this time pursued by the Dahaka, and left for the Island of Time after a heated argument with his father. Whilst the Prince was away, Persia was attacked by the forces of the Vizier, who drove Sharaman into the palace's catacombs and dispatched him. His sword, however, was recovered by the Prince, and his death provided his son with the willpower necessary to overthrow The Dark Prince. In the film, Sharaman adopts Dastan from the streets, and is shown to love him greatly. He is given a robe by Dastan, which fatally burns him. After Dastan turns time back before his death, he survives, and his fate is unknown after the film. Tus is Dastan's brother in the film based on the game. Dastan first thought he was the one who killed Sharaman, but then discovered it was Nizam. After gaining Tus' trust, the two are attacked by Nizam and the Hassansins. Tus is then killed, however, this is erased from time due to the fact that Dastan turned time back prior to his death. Tus then kills Nizam at the end, after Nizam's planned treachery was revealed by Dastan. Garsiv is Dastan's other brother in the film. His relationship with Dastan is strained, however, later on, Garsiv grows to trust his brother. Garsiv is then struck by a Hassansin dagger, and he apologizes to Dastan before expiring. His death is erased by Dastan's turning back time before his death. Princess Tamina is the name of a protagonist of the Prince of Persia film trilogy planned by Walt Disney Pictures. Tamina (played by Gemma Arterton) is a Princess whom Prince Dastan teams up with to rescue the Sands of Time, a gift from the gods that controls time, from the hands of the villainous nobleman, Nizam. Jordan Mechner named Tamina after Princess Pamina and Prince Tamino from one of his favorite operas, "Mozart's Magic Flute". One of the reasons she is not called Farah like her video game counterpart is that he did not want fans of the game to expect the characters' portrayals to exactly match. While her relationship with Dastan appears to begin awkwardly, the two appear to develop a love for each other. Sheik Amar is a mentor to Prince Dastan. He is portrayed by Alfred Molina in the movie, Prince of Persia: The Sands of Time. Nizam, portrayed by Sir Ben Kingsley, is the main antagonist in the 2010 film, Prince of Persia: The Sands of Time. Nizam is the brother of King Sharaman of Persia, and kills the king to blame the murder on Dastan. Nizam then claims the throne of Persia and, in order to achieve immortality and power, he seeks the Sands of Time and eventually take over the world. Malik is the Prince's brother, and was a mentor to him when they were younger. As adults, the two enjoy teasing one another. The Prince still looks up to Malik and follows his lead, even when he’s sure Malek is wrong. For his part, Malik is still protective of the Prince and doesn’t think his younger brother understands exactly what good leadership entails. Malik is a good leader, but stubborn. He has held his kingdom for years and refuses to give it up. He will use any means necessary to stop the invading army – including magic he does not fully understand. The Sultan is the ruler of Azad. He is supposedly a friend/ally of King Sharaman of Persia. The Sultan appreciates the finer things in life, as can be seen from his rotund appearance. He keeps a large menagerie of animals and has private harem where he may indulge in pleasures of a different kind. After the Persian victory in India, the Sultan is gifted the Hourglass with the Sands of Time as well as Indian slaves, including Princess Farah, and cattle by King Sharaman. When the Sands were released upon Azad, the Sultan was also transformed although the Prince does not encounter him. When the Prince performs the Grand Rewind and kills the Vizier, it is unknown whether the Persians still journey to Azad (but bypass India) or whether they turn away altogether. The Sultan's fate is unknown after "The Sands of Time". The old man (voiced by Hubert Fielden) has been watching over the Prince since he was a child. He treated the Prince as his own son, also sometimes acting like his mentor. He appears only in cut scenes, appears to be very wise, and knows a great deal about the Sands of Time and their creation place, the Island of Time. In "Prince of Persia: Warrior Within", he informs the Prince that an unstoppable beast called the Dahaka chases him for opening the hourglass of time. In Prince of Persia: The Two Thrones, he rallies the freed citizens of Babylon to rebel against the Vizier's army. The Maharajah is the mighty ruler of India and father of Farah and Kalim. Many years before the events in "The Sands of Time" he journeyed to the Island of Time with his Vizier and stole the Hourglass (which contained the Sands of Time), the Dagger of Time, the Medallion of Time, and the Staff of Time. In "The Sands of Time," he was betrayed by the Vizier, and King Sharaman of Persia invaded India, stealing the Hourglass, the Dagger of Time, many women as slaves (including Farah herself), and animals. Farah (voiced by Joanna Wasick and Helen King) appears as a protagonist in Prince of Persia: The Sands of Time and Prince of Persia: The Two Thrones. She is the daughter of the Maharajah of India, and thus a princess. Farah was captured and imprisoned by the Persian army in Prince of Persia: The Sands of Time, and was going to be offered to the sultan of Azad, among other gifts, as a sign of the countries' friendship. When the Sands of Time are unleashed by the Prince, Farah avoids transformation due to her possession of the Amulet of Time. Farah teams up with the Prince to lock the Sands of Time back up. She ultimately dies when she steals the Dagger of Time from the Prince. She is overwhelmed and trips off a cliff. The Prince attempts to save her by grabbing the Dagger of Time by the blade, but upon seeing his hand bleeding and losing grip on the Dagger she lets go and falls to her death. The Prince then seals the Sands of Time back into the Hourglass of Time, turning back time to a point when Farah was still alive. Farah is given back the Dagger of Time in her room, and warned about the betrayal of the royal vizier, which would result in the kingdom's conquer. Farah makes a brief appearance in Prince of Persia: Warrior Within. When Kaileena and Prince leave the Island of Time, the player see's the Prince's home of Babylon in flames. Farah is seen tied to a large pole with guards either side of her, amongst the burning city. Farah then goes on to appear in Prince of Persia: The Two Thrones. She has been kidnapped and brought to Persia by the Vizier. She eventually breaks free, and travels the city, saving the Prince at certain points. She eventually directly aids the Prince, but is again put off by the Prince's infection by the Sands of Time. She reconciles with the Prince, though, and is captured by the Vizier. She is then saved by the Prince when he kills the Vizier. Although not appearing as a character in Prince of Persia 2008, Farah is acknowledged in the game as the Prince character's donkey is named Farah. In Prince of Persia: The Sands of Time, Farah aids the player in combat with her bow. She is also able to crawl through small cracks and holes in the wall, which grants her access to areas the player can't reach. In Prince of Persia: The Two Thrones, she plays a vastly smaller role in gameplay as she doesn't aid the player in combat, and hardly even appears outside of cutscenes. She does, however, sometimes shoot down objects hanging by ropes, which the player can utilize to climb other obstacles. Son of the Maharajah, and brother to Farah, Kalim is desperate for his father's attention and affection. Armed with unseemingly unlimited army, he will do anything to impress his father. The Vizier (voiced by Barry Dennen and Harry Standjofski) appears as the primary antagonist of Prince of Persia: The Sands of Time and Prince of Persia: The Two Thrones and as a playable character in Battles of Prince of Persia. In Battles of Prince of Persia, the Vizier fell in love with a demigod Daeva, Sindra. When Sindra refused his advances, the Vizier retrieved the Box of Ten Thousand Restraints and imprisoned the entire Daeva race in it. In Prince of Persia: The Sands of Time, the Vizier, the Maharajah of India's most trusted adviser, betrays his kingdom to the Persian army in a plot to achieve immortality using the Sands of Time. When he is refused the Sands of Time as his reward, the Vizier goads the Prince character into releasing the Sands of Time. The Vizier attempts and fails to retrieve the Dagger of Time from the Prince, however, and is transported back through time with all of his memories when the Prince locks the Sands of Time. He attempts to kill the Prince in Farah's bedroom, but is killed in turn. The Vizier appears again in Prince of Persia: The Two Thrones, again attempting to achieve immortality through the same means as before. Because the Prince altered the timeline of the game world, the Vizier was never killed. His men capture the Empress of Time, and he kills her, then impales himself with the Dagger of Time and becomes immortal. He then conquers the Persian capital, Babylon, entirely, and names himself as "Zurvan". He is eventually killed by the Prince, impaled once again by the Dagger of Time. The Vizier's Generals are four of the strongest singulars in the Vizier's army and his greatest allies during the events of The Two Thrones. They consist of Klompa, Mahasti, and Sword and Axe. All of these are bosses to fight in The Two Thrones, with varying tactics for each. Klompa is a powerful ally and one of the Generals of the Vizier's army, wielding a spear in his human form. He was there when the Vizier killed Kaileena and released the Sands of Time over Babylon. When he was transformed by the Sands, he became a tremendous grotesque giant. Bearing many wounds, he is now jaw-less and dons a mask and a tremendous sword. He makes his home in the Arena, where he has captured many Babylon people. The Prince defeats him by jumping onto Klompa's head and then stabs him in each eye. After which, he is killed by the Prince, and disintegrates into sand. After Klompa's death, the Prince frees the citizens that Klompa has taken prisoner. Unfortunately, the Prince's dark side, The Dark Prince, then emerges, and the Prince jumps down a hole to stop the freed citizens seeing him. Mahasti is a trusted General of the Vizier. She is responsible for embedding the Daggertail in the Prince's left arm just before the Vizier killed Kaileena and released the Sands of Time. It appears that the Sands have not been so merciless in destroying her appearance as they were with the other characters, although they have granted her strength and extraordinary agility. She imprisoned many women in a Brothel and confronted Farah and the Prince. Realizing she was outmatched, she fled. The Prince then gives chase, and battles her. Halfway through his fight, the Prince turns into The Dark Prince, who fights with her and pushes her off a ledge, ending her life, ignoring her warning that he would fail to defeat the Vizier. Axe and Sword are both powerful Generals of the Vizier's army. Together they fight as one nearly unstoppable force. Axe locks the Prince in a burning workshop , leaving him to perish in the flames. The Prince escapes, saving many citizens and then pursues Axe on a chariot. The Twin Warriors gang up on the Prince and fight him in a ring of fire. The Prince manages to kill Sword, but gets tired out and falls to the ground. The wounded and enraged Axe charges at him, but is finished by Farah's arrows, who arrives just in time after splitting with the Prince. Kaileena (voiced by Monica Bellucci and Sarah Carlsen in The Two Thrones) plays a role as a primary antagonist and later love interest in Prince of Persia: Warrior Within, and a role as narrator in Prince of Persia: The Two Thrones. In Prince of Persia: Warrior Within, Kaileena offers advice and tools to the Prince character. She then reveals to him that she is the Empress of Time, and is subsequently killed by him, with the Sands of Time being her remains. The Prince, however, resets the timeline using the mask of wraith, going back to before he killed her. She re-lives all of the events that occurred, but is pushed into a portal, sending her into the future (the present time in the game). She is immediately pursued by the Dahaka, but ultimately saved by the Prince; in the end, she travels with him to Babylon, later gaining a strong sexual relationship with him, though he does not truly love her. Another ending shows Kaileena actually being killed by the Prince and absorbed by the Dahaka, with it being the first ending. Once in Babylon, the duo's vessel is ambushed, and Kaileena is taken to the Vizier, who kills her. Kaileena is once again incarnated by the Sands of Time at the end of the game, when she takes the Sands of Time away from the world and heals the Prince of their corruption. Shahdee (voiced by Alicyn Packard) is a minor antagonist in Prince of Persia: Warrior Within. She is scantily-dressed with a black, short haircut. A subordinate of the Empress of Time, she is tasked with preventing the Prince character from reaching the Island of Time, under the penalty of death. Shahdee and her crew attack the Prince's ship during a storm at sea. Shahdee confronts and defeats the Prince, disarming him and kicking him into the sea. The Prince, however, survives, and the Empress of Time attempts to kill Shahdee as a result. Arriving on the scene, the Prince thinks rather that Shadee is trying to kill the Empress of Time, and thus intervenes, killing Shahdee. These beings are entities from the Box of One Thousand Restraints. After the Prince releases them, then sets out to seal them once again within the Box, while fighting in a war. Aesma: He is one of three daeva generals. the other two are Saurva and Sindra. Aesma is the second strongest out of the three. Saurva: He is the leader of Daevas and prince of Aresura. Armed with an unbreakable will he will do anything to protect his people. Saurva was forced by the Vizier to obtain the Box of One Thousand Restraints, and after doing so, was imprisoned along with all the other Daeva because of Sindra's refusal to marry the Vizier. Sindra: She is a daeva and Saurva's sister. At a point in time, the Vizier fell in love with Sindra. He became so infatuated with her that he forced Saurva to steal the Box of One Thousand Restraints, for then unknown reasons. He threatened to kill Saurva's wife if he failed to do so. When Saurva returned with the Box, after killing many Indian soldiers in doing so, The Vizier killed his wife and imprisoned Saurva, along with all the daevas, in the Box when Sindra refused him. Ahriman is the ancient god of darkness, and the major antagonist of Ubisoft Montreal Studio's 2008 action/adventure game Prince of Persia and Prince of Persia: The Fallen King. He was sealed thousands of years before the events of the game by Ormazd, the god of light, into the sacred Tree of Life. He was voiced by both Kwasi Songui and Catherine Kidd. He offers a (sometimes false) fulfillment of one's greatest wish in return for their soul. It was by offering resurrection to The Mourning King's daughter, Elika that made The Mourning King sell his soul and become one of the Corrupted, freeing Ahriman in the process. Later, Ahriman offers the resurrection of Elika to the Prince in return for his freedom. Ormazd is the god of light and good and brother to Ahriman, both lived keeping in balance until Ahriman wanted more power, resulting him into attacking Ormazd, causing an all-out war between the two. In the end, after a cosmic struggle, Ormazd succeeds in vanquishing Ahriman, trapping him into the Tree of Life. But after seeing the destruction the war caused, he ascended into the stars, leaving behind his people, the Ahura, to guard and protect the Tree of Life. In the 2008 video game Prince of Persia, Elika (voiced by Kari Wahlgren) appears as a barefoot AI-controlled protagonist and companion to the player. Before the events of the game began, Elika died. Ahriman, the primary antagonist and god of darkness, then offered to resurrect Elika in return for his own liberation, and Elika's father accepted the offer. Elika, against her own wishes, was then resurrected, but fled from her father, intending to re-imprison Ahriman. While fleeing, she encounters the Prince character, who decides to accompany and aid her. With his help, she fends off her father and his men, and arrive at the location where Ahriman was imprisoned. Then her father arrives and breaks the seal holding Ahriman, releasing him. Elika flees with the Prince character, and devises a plan to re-imprison the dark god. She plans to systematically travel to and heal specially designated areas of land called fertile grounds, which Ahriman is using to gain more power. With the aid of the Prince, she succeeds at this, but gets weaker with each healing. When she finally heals the rest of the land, she gives her life force to repair the prison Ahriman was kept in, and dies. She is soon resurrected by the Prince, however, and once again tasked with imprisoning Ahriman. The Corrupted are Ahriman's selected soldiers. Each of the four Corrupted were released with the destruction of the tree of life during the beginning events of Prince of Persia, and each takes domain in one of the four sections of the kingdom. Throughout the game, the Prince and Elika must travel through these four domains, and vanquish each Corrupted to heal the land. Each Corrupted was once human, but sold its soul to Ahriman one thousand years before the events of the game, to achieve their life's purpose. Ahriman granted them the means to serve their desires, but twisted those means to serve his own purposes, driving each away from themselves, and towards him. These deals with the devil feature classic human desires, such as power and immortality. The Hunter engaged in a struggle with the Prince character. The Hunter (voiced by Sebastien Croteau) is a fierce, energetic beast that uses agility, speed, and acrobatics to his advantage. Once, he was a prince who indulged in many treasures, but became obsessed mainly with the thrill of hunting. Soon, though, the prince grew tired of his favorite sport, believing himself a hunter unrivaled after killing one of each animal in existence. Ahriman caught word of the prince's discontent and offered him a chance to hunt a foe beyond all others. The prince, unable to resist such a temptation, exchanged his soul in return for the ability to hunt such a beast. Ahriman then twisted the prince into a possessed monster. The word of said monster spread to the far corners of the world, and many men came to hunt it. The prince's wish was granted, and he now had the means to hunt the most dangerous creature of all time: man. The Alchemist is a cold and unforgiving manipulator of Corruption, a sign of his old cockiness as one of the greatest scientist of the Ahura. His turn to Ahriman only fueled his ambition of achieving immortality even more. When the Prince fights with him, the Alchemist often attempts to delude him with thoughts of immortality, although neither the Prince nor Elika are even slightly convinced. The Alchemist was once a brilliant man who thought he had the knowledge to unlock the secrets of life itself. He became frantic as his body began to weaken, so he pleaded to Ormazd for just a few more years, as he felt absolutely certain that he could discover the secret of immortality. When Ormazd did not reply, he turned to Ahriman, who gave him the ability to manipulate Corruption in exchange of his soul. With his newfound power, the Alchemist abducted people, and used the Corruption to conduct experiments on them. The Warrior was a king whose people were under attack by an enemy army. As peace lovers, his kingdom refused to fight back, and so was starting to crumble, his civilization being the victims of genocide. Soon enough, the king grew frantic in his search for the means to protect his people, and he was driven to ask Ahriman for said means. In exchange for his soul, Ahriman gave the king the power to defeat the rival army and save his people. In the process, the king was changed into an unstoppable monster of war. As this monster, his peace loving people rejected him, seeing his only purpose was for war. The king now serves only Ahriman. The Concubine (voiced by Lucinda Davis) used her beauty and power to influence political affairs in the Royal Court, but was scarred and beaten by another woman when she was attempting to influence a man. Stripped of her beauty, and means to acquire influence, she turned to Ahriman for power. She re-gained the power to read the desires of the man she wanted to impress and literally transform to fit those desires, but there was a downside. Said man would wake up with her every morning and not recognize her, so she had to flee from him, transform once again to fit his new desires, and attempt to woo him again, every night. She grew tired of this process, and soon enough Ahriman called her to serve only him. The Mourning King (voiced by Fred Tatasciore) is the last king of the great Ahuras, and Elika's father. Before the events of the game, Elika and her mother died. The Mourning King, driven by grief, sold his soul to Ahriman in exchange for the means to resurrect Elika. He was then given a task; to destroy the tree of life, freeing Ahriman. He gave the essence of the tree of life to Elika, resurrecting her. She rejected him, however, for freeing Ahriman, and so he was driven further towards Ahriman's influence. By the end of the events of the game, the Mourning King becomes a full Corrupted, as Ahriman calls the king to serve only him, and give up his endeavors for Elika. Ratash is an Ifrit. He is a boss and the main antagonist in Prince of Persia: The Forgotten Sands. A Lord among the Ifrit in the time of King Solomon, Ratash rebelled against the pact between Djinn and Humans. He used his Djinn magic to create an army out of the desert sand, which quickly grew beyond his control. King Solomon and the leaders of the Djinn worked together to imprison Ratash and his army. Now that he has escaped, he is sending his army against humanity again. Darius is a Persian general and a mentor to the Prince in the game Battles of Prince of Persia. After the events of Sands of Time, he was the first to be killed by the Dahaka. Darius pushed the Prince out of the way, so that he would be unharmed. Since that night, he was haunted by the ancient creature. Arun is an Indian general, only appearing in Battles of Prince of Persia. Assan is the Sultan's brother, ruler of a distant land. Assan tricks the Sultan and his family into coming to his palace. He attempts to imprison the Prince, but he escapes, and goes after Assan. It turns out that the Sultan and Assan had a pact that the Princess would marry Rugnor, Assan's son. He attempts to kill the Prince, but the Sultan blocks the blow, and is killed. Assan flees, and his fate is unknown. Rugnor is an interesting creature: half man and half tiger, he is ruthless, cruel to the teeth and covets the Princess. He is also very powerful and a master Swordsman as well. The Prince has to escape from the dungeons and chase Rugnor, as he carries the Princess away. The Prince has to fight his way through several levels including the unique Dirigible levels. In the final level, Rugnor sets a huge piece of machinery, a mechanical Gear as big as a room, to which he ties the Princess up. The Prince has a small window of time to fight and defeat Rugnor. The Prince slays Rugnor, and rescues the Princess. Zahra is a genie who the Prince meets in the Wii version of The Forgotten Sands. She promises him a kingdom, a princess, and a mastery over death. However, she and the Prince get separated at the end, as Izdihar crumbles. However, the narrator reveals that Zahra was the princess all along, and she is still alive. In Prince of Persia: Warrior Within, the Dahaka serves as the physical manifestation of the inevitability of fate and is also a primary antagonist in the second ending. The Dahaka appears to be a massive, black humanoid creature with horns. The Dahaka has a weakness to water, and can only be killed by the legendary Water Sword, found by the Prince if the player obtains all life upgrades, unlocking the second ending. The beast is the guardian of the timeline, and seems to appear only when the timeline is disrupted. The Prince character's actions in Prince of Persia: The Sands of Time result in the manifestation of the Dahaka, its duty to eliminate the Prince. Ultimately the Dahaka's focus is averted to eliminating Kaileena, which it succeeds at in the normal ending, but is killed by the Prince before it can kill her in the second ending. The name alludes to Azhi Dahaka from Zoroastrianism. Razia is Queen of the Marid, Guardian of the Waters and ally to King Solomon. She bestowed various powers over the elements to the Prince, most notable of which is extreme control over water. She is one of the characters in Prince Of Persia:Forgotten Sands. As queen of one of the tribes of the Djinn, Razia has stayed in the city for centuries; her magic protects the reservoir that keeps it an oasis in the desert. She remembers the army – and was there when it was sealed away. When she realizes what has happened, she appears to help the Prince – while partly blaming him for letting Malik release the army in the first place. Razia is regal and stern; she doesn’t ask, she commands. The Prince isn’t used to being treated as a servant rather than royalty, and resents it. Razia, being a djinn, was necessary to the Prince to defeat Ratash, who happened to be another evil djinn. Only the magic of one djinn can destroy another, and so Razia embeds herself into the Prince's sword, and when the Prince kills Ratash, it is believed that both Razia and Ratash have died. King Solomon was a powerful ruler. He was an ally to Razia and the Marid. The territory under Prince Malik's rule was once the heart of King Solomon's mighty empire. According to legend it holds a secret which the Persian royal family are sworn to protect. The Prince is referred to by Razia as Son of Solomon. Zal is a protagonist in Prince of Persia: The Fallen King. He is a magician who utilizes magic similar to the way Elika does to aid the Prince in freeing Persia from Corruption. He is dressed in red robes and, as a result of being in contact with Corruption, his entire bottom half is made of Corruption, so he levitates. He is the king of City of the New Dawn and was split in two when he attempted to fight Ahriman. He kills the fully Corrupted half of himself at the end of the game and, as a result, is brutally murdered. After the Prince has been infected by the Sands, a dark second personality awoke inside of him. This dark, grim character, only appearing in The Two Thrones, reveals that he is a manifestation of all the Prince's dark attributes. He, for the most part, is a disembodied voice which constantly taunts the Prince, as well as advise him on how to defeat his enemies. If the Prince is under certain emotion, the Prince transforms into this dark half, using a chain-like weapon called a Daggertail. The transformation is then reversed when the Prince comes in contact with water. Later on, the Prince then learns to ignore the Dark Prince, fighting for the safety of his people, and not for revenge. The Prince then falls into a well, and argues with the Dark Prince, until the Prince finds his father's corpse. The Dark Prince then mocks him, which then, leads the Prince to face the consequences of his actions. The Dark Prince is then seemingly silenced. After the Vizier's death, the Dark Prince takes the Prince into a mental realm, where the Dark Prince plans to take control of the Prince's body. He then is defeated when the Prince simply leaves him behind. He is voiced by Rick Miller. The mightiest fire spirit. He is the main antagonist of Prince of Persia : The Forgotten Sands, PSP version. He has been told about a prophecy about him dying at the hand of a member of a royal family. So, he started to send his assassins to kill all royal family members. He has a winged demon appearance and his body covered with flames. He also steals the elixir to gain more power for himself.He makes The Daughters of time his prisoners and steals the elixir from them. ^ a b "Kingsley is Persia Baddie". IGN. 2008-06-06. http://movies.ign.com/articles/879/879781p1.html. Retrieved 2008-06-06. ^ Chester, Nick (2008-12-02). "Destructoid review: Prince of Persia". Destructoid. http://www.destructoid.com/destructoid-review-prince-of-persia-113233.phtml. Retrieved 2008-12-10. "And outside of an early reference to The Sands of Time -- the story begins with our new Prince looking for a donkey he calls “Farah,” an obvious wink to the previous trilogy’s female lead -- this game truly stands on its own in nearly every way."